small can chopped green chili (available same place as hominy, make sure to get green CHILI PEPPERS, NOT pickled jalapenos). The chili peppers come in mild or spicy—just use whatever you prefer. 1 large can whole tomatoes from Costco (this is the LARGE can, like the kind that Que Bueno nacho cheese comes in. If it’s affordable, it’s better to used canned stewed tomatoes instead of the whole tomatoes, but whole tomatoes are much cheaper and taste good too). 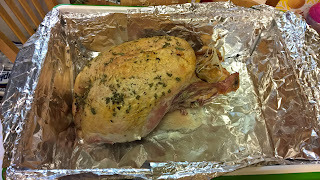 -Ask a helper to put on gloves and tear the meat away from the bones of both chickens. Discard the skin (too much saturated fat and your soup will be too oily). 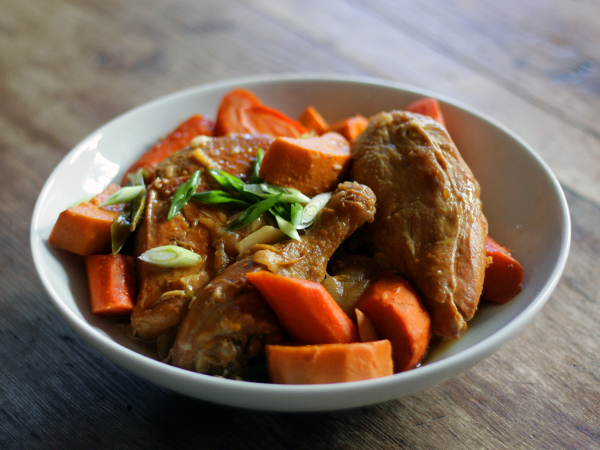 -Chop the carrots, onions, potatoes and celery into soup-size pieces and place in a large stock pot. -Empty the can of chili pepper and the bag of corn into the pot. -Open the can of hominy and the cans of black beans. Drain both, then empty them into the pot. -If you are using canned chicken broth, put it in now. Otherwise, fill the pot with water until it just covers all the stuff you have in the pot. -Turn the heat on HIGH and cover. -Open the can of tomatoes, but leave part of the lid attached. Drain the liquid from the can INTO your pot (the extra tomato flavor is nice). -Cut the tomatoes into soup-size chunks and put them in the pot. -The liquid in the pot should be hot now. Take a small amount of the liquid into a bowl and dissolve the bouillon into the liquid, one cube at a time. Then put it into the pot. -Stir in the cans of condensed soup. Mmm...this looks yummy :) Love the new Dishgracepoint layout! Thanks Aileen! I enjoyed making it for people! 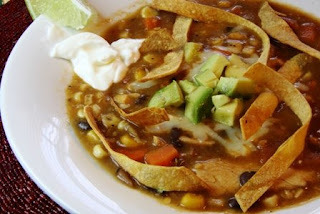 Dang, if delicious can be liquefied and poured into a bowl, that's what you would get with George's Chicken Tortilla soup! Amazing!!! Or in Korean, "Amajing!" We ate this like 3 times in our Compassion group! It turned out delicious when Barbara and I made it.